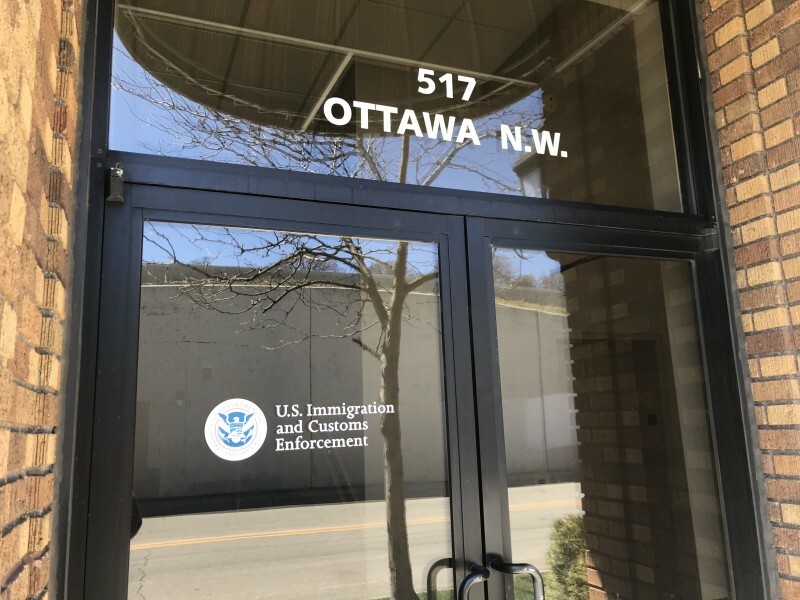 Cosecha GR and GR Rapid Response to ICE cohost a press conference decrying recent arrests by ICE in the Grand Rapids area and urged community members to attend a march on May 1, 2018. 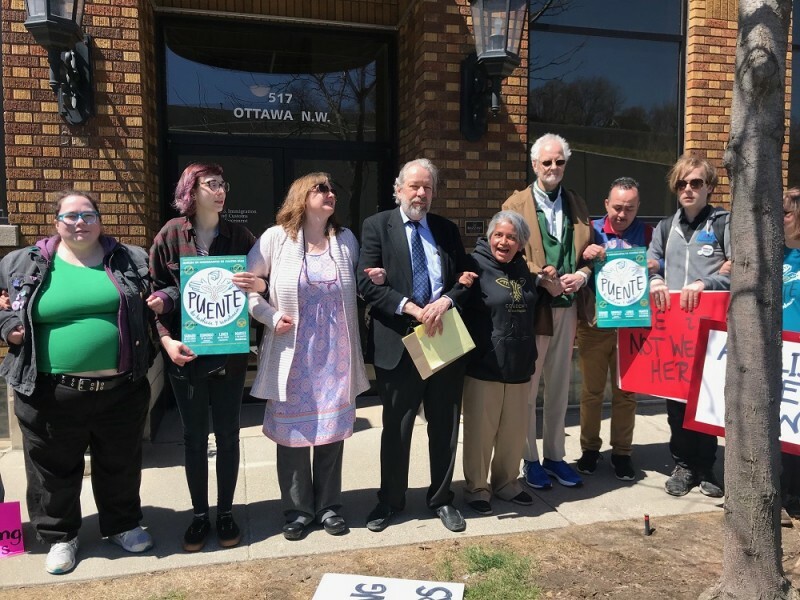 On Wednesday, April 25, Cosecha GR and GR Rapid Response to ICE cohosted what they called an emergency press conference at the corner of Hastings and Ottawa on Grand Rapids' northwest side. About 20 people, both speakers and supportive protesters, gathered in front of the Department of Homeland Security offices. Five people spoke, including Gema Lowe, Director of the Workers Center of West Michigan and Cosecha organizer; a man identified as Martin; Amy Carpenter from GR Rapid Response to ICE; Reverend Al Heystek from the United in Christ of Church, and Richard Kessler, an immigration lawyer. 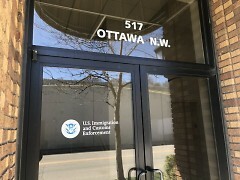 Before the press conference began, while speakers and supporters were arriving, two ICE agents were parked in their Homeland Security vehicles, one on Hastings and one on Ottawa, keeping an eye on the proceedings. The officer parked on Ottawa talked to everyone coming from his direction, asking them if they’d paid the parking meters, or telling them they couldn’t park in certain lots because they were not guests. She continued, "People are being kidnapped from our community and asking a ransom of thousands of dollars for that person to come back into our community. This is an outrage. We as a community are going to march together and present this issue so that people in the community, so that people in Grand Rapids and West Michigan all together know that our comunity is standing with us. We are going to march together and not let ICE terrorize us like they have been doing." Martin spoke in Spanish with great emotion, “Soy un imigranta a los Estados Unidos” or “I am an immigrant to the United States.” Translated by Lowe, he said, “I came here for a better future for me and my family. ICE is pushing and putting fear in our communities. There is no more fear, there is no more fear. There fear was left down in my home country. There’s no more fear. We need to stand together. We invited everyone to come march May 1st all together. We have strength in numbers." During Martin’s statement, ICE interrupted to tell speakers and supporters on where to specifically stand on the sidewalk to allow pedestrians passage. Reverend Al Heystek said, “I’m an ordained minister from the United Church of Christ, a tradition that has been an advocate for love and justice. I bring a lot of deep disappointment and sadness and pain about what’s happending and how families are separated from each other. I especially think about the pain for children, especially children who see their parents torn away by these policies." Lowe concluded the press conference urging people in both English and Spanish to attend the Cosecha organized march on May 1, 2018. During the press conference, a Grand Rapids Police car drove by and stopped to talk to one of the ICE officers. The two ICE officers also came in closer and closer towards the group during the press conference standing within a yard or two to see what was going on. At the end of the press conference, speakers and supporters linked arms in front of the ICE office and chanted, “Hasta La Huelga!” or “Until the Strike!” It’s a play on “hasta luego” which means “until I see you again,” urging community members to participate in the upcoming strike and march.